Squeaking this one in under the wire—the last two weeks have been a whirlwind (I expect I’ll be saying this for a while)! SASS seems to have more available tools to help developers: frameworks like Compass, mixin libraries like Bourbon. LESS has libraries, too, but they’re not quite as powerful and less cohesive. SASS offers selector inheritance via @extend, which is pretty sweet. SASS has better logic than LESS, which is fairly limited. Fun fact about colors in SASS: the native lighten and darken functions aren’t stellar—they move pretty quickly into complete white/black, rather than tinting or shading things gradually. To fix this, you can use mix to adjust your colors with a bit more control. You can also write custom tint and shade functions that mix colors with white and black to lighten or darken more gradually. A CSS style best practice I didn’t know before: you should sort your rule declarations by property name in alphabetical order. In hindsight: I wish I’d spent more time thinking about my data models, key functionality, and game logic first. I wrote a handful of user stories and spent a lot of time playing tic-tac-toe and diagramming win conditions, and I didn’t start *coding* the design until I had was able to authenticate users, play games, and log them to the server, but even as I worked on those things, I kept having to stop and reorganize my code to accommodate new features. Taking an hour or two to try to diagram the flow of logic and the exact points at which I needed to interact with the server would have brought more helpful structure to my approach and, I think, kept my code more elegant. Give it a whirl here (and please do let me know if you find any bugs! ), or check out the code on GitHub. Things I learned: I wrote a bit about my adventures in game board design earlier. 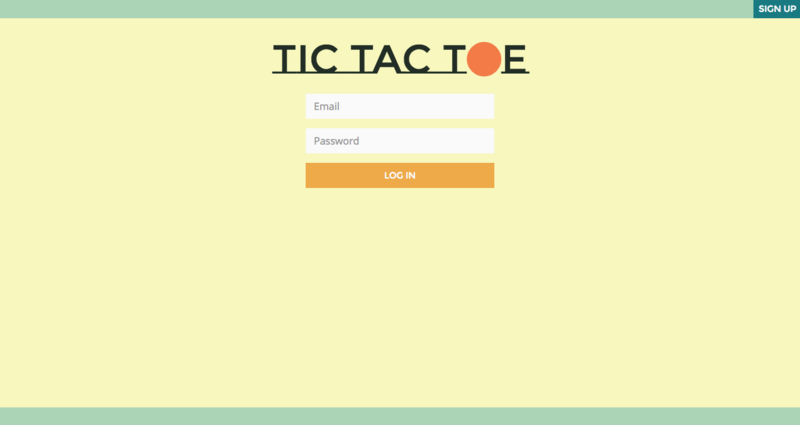 As I built the functionality, I got some great practice with AJAX (including learning how to pass additional data to AJAX callbacks), and as I styled, I learned how to make a sticky footer. 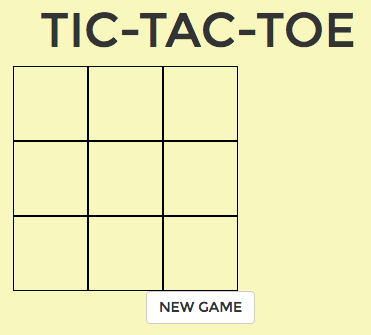 I also learned that it’s shockingly, embarrassingly easy to keep reverting to “x and y” instead of “x and o.” Warning to future tic-tac-toe game developers: this will cause you at least an hour of distress. Current status: I’m midway through fixing a few small bugs, and I’m still waiting to hear feedback from my instructors at GA—I’m planning to ask them about ways to refactor/restructure and make my logic and flow a bit more elegant. On to week 4 (which is coming to a close today, so expect another recap soon!)! In which I am resourceful, if not efficient. It wasn’t time to panic—I could fix this! All I needed to do was to give the board a background, round its edges board, remove the outside border, thicken up those grid lines a bit, and—the final touch—round the edges of the grid lines to better match the overall feel of the game. I thought about doing this in CSS, but Googling didn’t turn up a way to put round endcaps on border lines in CSS. Rather than wasting time (HA. HA HA HA. This is the part where there’s a freeze frame, and you remember that I said this for the rest of the story for it will prove to be ironic. ), I decided to open up Photoshop and make a background image that I could drop into the game board div and be done with it. Teensy problem: I don’t currently have access Photoshop, a fact I remembered late Thursday night. I was faced with two options: research open source / low cost graphics programs, acquire one, learn how to use it. Or: further investigate this stroke-linecap attribute that showed up when I was Googling before. Given that I identify deeply with this joke about Atom, and that it applies to almost every application on my six-year-old laptop, I decided to avoid installing something new. Time to code an SVG element! Solution: pull all the SVG code into a separate file. Apply inline styling. 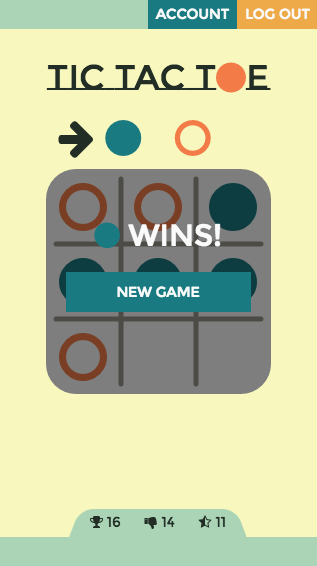 Use the SVG as a background image on your game board div. Go to add/commit, and realize that the provided template for your project includes SVG files in its .gitignore, which you’re too afraid to overwrite because you don’t know why that choice was made in the first place. Export to PNG using SVGtoPNG.com. Since you’re now using PNG, which doesn’t scale well, make a bigger version of the SVG to use on larger screen sizes, and export that. Finally end up using image files like you always intended, only you’ve taken the VERY LONG WAY there. What’s the point of this blog post? It’s part cautionary tale—be careful not to get so attached to an aesthetic that you end up spending hours on a single, unimportant element of a project (unless, of course, that’s actually your job). There are better ways to do this: use SVG correctly and write the code that makes it scale. Ask your instructor (or your boss) why they don’t want SVG files in your git repo, and see if you can work out a better solution together. I’m also writing this because it’s a good reminder to myself that I can be resourceful. I had a goal, and I achieved it with the tools at my disposal. 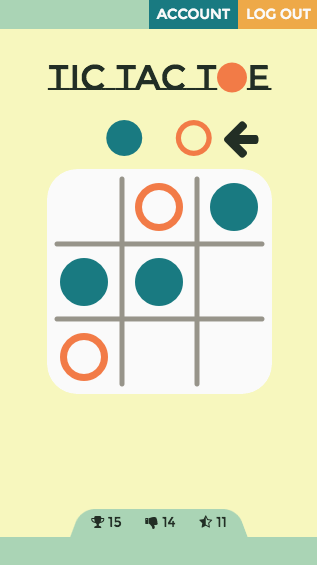 And now it’s part of a functional public Tic Tac Toe app that anyone—even you?—can use! All in all: a good day. Some fun side notes: while writing this, I ended up using git checkout [commit hash] to (temporarily) go back to an earlier version of my code, pre-svg, so I could grab screenshots. The Atlassian tutorial on Reset, Checkout, and Revert has an excellent explanation of how to do this. Friday wrapped up my second week of General Assembly Boston’s Web Development Immersive program: as of this weekend, I’m one-sixth done, which is at this point mostly terrifying. How can there be only ten weeks to go?!? I feel like I’m learning cool things (making AJAX requests that use methods other than GET, for example), but in a very, very controlled and somewhat black box-y environment. GA’s basic approach to a day of class is: pull down these git repos, run Node and/or Bundler commands, and then open up a specific file and do a specific thing. I understand why they don’t want to throw us off the deep end and go too far into things like “runtime environments” and “what is a gem” while we’re still asking questions like “what does ‘PATCH’ mean?,” but at this point I would struggle to implement what I’m learning outside of the structure of GA’s pre-packaged tooling. The value of this doesn’t change (and can’t be changed) within a fat arrow function. this is fixed at the value it was when the function was called. (This is also known has “having only a lexical this, not a dynamic this“). Fat arrow functions can’t be used as Constructors: they don’t have a prototype, and they don’t have a Construct method. Fat arrow functions don’t have an arguments variable. A bunch of methods for array manipulation: .every().filter(), .forEach(), .map(), .reduce(), and .some(). Apparently it’s now déclassé to set CSS styles on IDs. 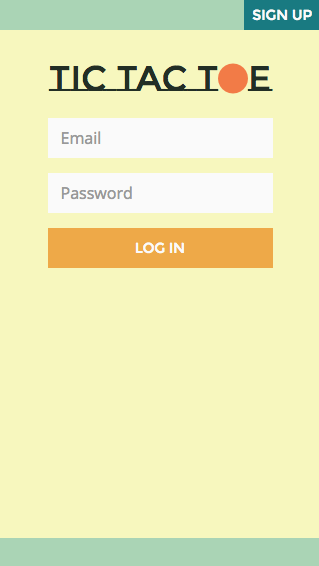 Building multi-row, multi-column CSS layouts from scratch: a serious weakness of mine. Ouch. Also, wireframes that don’t conform to a grid: BOOO. There are THREE values for box-sizing: content-box (default), border-box (reasonable), and padding-box (only supported in FF.). More in CSS Tricks: Box-Sizing. An explanation of those horrid unwanted spaces between inline-block elements. First time using Rails! Though only very, very lightly: we cloned the existing Rails code for a simple API and got it running locally so we could make curl and AJAX requests against it. “Predicate” functions return true or false. Begin names of predicate functions with “is” (isEven, isOdd, etc.). Use “on” as a prefix for handlers (onGetAllBooks, onSignUp, etc.). You can use debugger; as a standalone line in Node to set a breakpoint. call stack: data structure. records place in the program. step into a function: add something to call stack. complete a function: pop it off call stack. slow things “block” the stack b/c JS can only do one thing at at time. particularly bad in JS b/c of browsers: you click on a button and get stuck, and the browser can’t return that button back to its un-depressed state. everything hangs. this is because the browser can only render when the call stack is empty. callbacks get pushed to a queue when they’re ready to run, NOT to the call stack. the event loop monitors the queue & the call stack. when the call stack is empty, it moves one thing from the queue to the call stack so it can run. this is why callbacks passed to setTimeout with a timeout of 0 ms will run *after* lines of code that follow setTimeout. the event loop has to wait to give that callback to the call stack until the call stack is empty, even though the timeout is 0.
setTimeout is not a guaranteed time to execution. it’s a *minimum* time to execution, since we have to wait for call stack to clear before callback can run. We spent the last three days of this week on HTTP methods (GET/POST/PATCH/DELETE) and AJAX. We started by using curl requests to interact with a basic books API, then built AJAX requests to replicate that process in the browser (click on a button, send the request, handle success and failure). Day 10 focused on authentication: signing up/logging in/logging out, and doing things (changing information, viewing protected information) that require an auth token. Template literals, fat arrow functions, callbacks, closures, and overwhelming joy. cd - takes you to your previous working directory. SO HANDY. I fixed my first-ever merge conflict! GA emphasizes frequent commits and long commit messages. This wasn’t part of the course, but I recently learned about Angular.js-style commits, which seem like a great way to organize and communicate. Not new, but a good reminder: i++ (prefix increment) will return i, then increment. ++i will increment, then return the new value of i. This will give you an object where the keys are the unique elements in the array, and the values are true (as a convention; you can choose anything you want for the values). This is much simpler than my original approach, which involved…comparing all of the elements of the array to all of the elements? I don’t know. It was complicated and involved, and I don’t recommend it. Do this instead. If you want the final format to be an array, you can use Object.keys() to extract the keys (the unique words) and store them in a new array. Object properties are “attributes” when they point to values/primitives. Use constructor functions to attach attributes to an object. Properties that begin with underscores are private (by convention): not intended for direct access or assignment. We started using node to run and test scripts. A callback is a function that is passed as a parameter to and executed inside of another function. When filtering and transforming an array (arrresultsresults[i] within an if statement can result in “holes” in the array when the original arr[i] doesn’t pass the filter. It’s better to use results.push to skip values that don’t pass, resulting in a cleaner results array. Template literals (WHAAAAAAAAT so cool).